What looked like a local problem in Florida now smells more like a nationwide emergency. There are 20 reported cases of animals exposed to the toxins, as well as some 100 dead ducks found in one of the more than half-dozen canals that connect to the Jordan River. A toxic bacterium, similar to that causing a state of emergency in Florida, is now terrorizing Utah, with hundreds already reported to be poisoned by contaminated water. 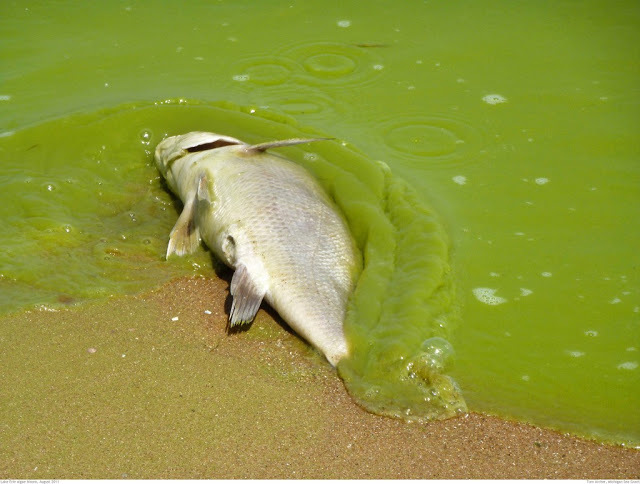 Roughly 330 people in Utah were reported poisoned, after exposure to water contaminated with dangerous levels of cyanobacteria, the same microorganism that has contaminated waters in Florida throughout last two months. According to Barbara Insley Crouch, executive director of the Utah Poison Control Center, the 330 documented cases have symptoms including vomiting, headache, diarrhea and abdominal pain. A high exposure to the bacteria can cause respiratory problems and skin irritation. "These were individuals who were recreating on or near the water at Utah Lake," Crouch said. Many more may have also been exposed at the Jordan River, the lower Little Cottonwood Creek or the lower Spanish Fork River. There are 20 reported cases of animals exposed to the toxins, as well as some 100 dead ducks found in one of the more than half-dozen canals that connect to the Jordan River, according to State Department of Environmental Quality reports. Divers have cut a water intake from the Jordan River to the Rose Park Golf Course, and Kennecott Land has shut down access to Oquirrh Lake at several streams. Local farmers that rely on Utah Lake and the Jordan River for crop watering are urged to refrain from using the water, as the bacteria may become aerosolized in pressurized systems. Some 1860 miles away from Utah, the cyanobacteria previously attacked water regions in Florida, starting with Lake Okeechobee, in the last months. Florida waters have become covered with a "guacamole thick" layer of "algae" (technically, a cyanobacterium is not an alga) that "smells like a hundred dead animals." The outbreak that caused state Governor Rick Scott to declare an emergency in four south Florida counties, is caused by overuse of fertilizers that enrich the water with both phosphorous and nitrogen, both essential for rapid cyanobacteria growth. What looked like a local problem in Florida now smells more like a nationwide emergency, according to some. We from essayrepublic.com hope that this can be mitigated sooner. This is truly a sad news and a cause for emergency. Hope that the locals are all well.